At each level of Froggy Match-it there are ten free writing sheets to download. 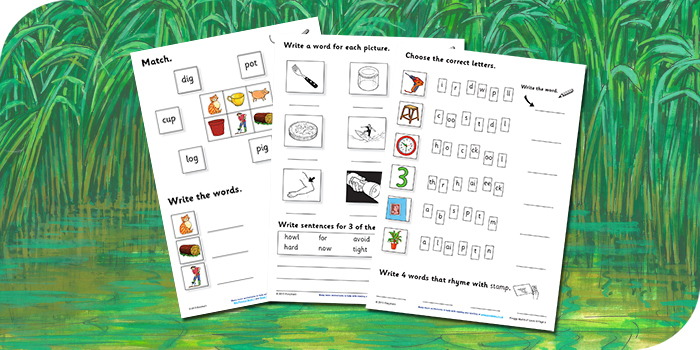 These free writing sheets are based specifically on the type of phonic words covered in the related level of the reading game, and the first pages relate directly to the interactive activities. Just as the phonics games in Froggy Match-it are graded, so are the writing sheets, and levels become progressively ‘harder’. Most sheets can be completed by children independently, but they are an excellent way for parents to work with their children. The writing sheets are designed so that children use the reading and spelling skills they have acquired in the interactive phonics game, spell words in sentences and also practise their handwriting. By using the educational games, worksheets and e-reading books, children become confident and fluent readers, learn to spell accurately and develop their writing skills. Click on the appropriate link below to download the writing sheets you want. Don’t forget, in addition to these sheets, every month, there are other free writing sheets, providing alternative approaches. Short vowel sound, consonant-vowel-consonant words: words such as tap, pin and dog. Short vowel sound, consonant-vowel-consonant words: words such as cat, leg and sun. Short words with double letter endings plus sh and ch: words such as ship, bell and sock. Common spelling of the long vowel sounds: words such as nail, boat and sheep. Further vowel digraphs: words such as card, torch and soil. Short vowel sound words with adjacent consonants: words such as flag, pond and lamp. Short and long vowel sound words with adjacent consonants: words such as train, drink and toast. Words with long vowel sounds and split graphemes, ending in e: words such as kite, rope and frame. Further graphemes for some long vowel phonemes already encountered (ea, ay, aw, ou, oy, ew, ir) plus air and ear: words such as leaf, tray and chair. Alternative spellings for long a, e, i, o and u: words such as nail, clay and cake. Alternative spellings for other vowel digraphs (ow & ou, oi & oy, ur, ir & er, or, aw & -all, air & are, eer & ear): words such as town, cloud, coin and boy. Alternative spellings: a mixture of the type of words used in levels 9 and 10.